This week, in a special review, we’re going to look at Twitter, a free service available at http://twitter.com and available on any system that can operate a modern web browser. Now, there are many worthwhile clients that access and add value to Twitter, but we won’t be looking at any of those in depth until later articles. When I realized that Twitter deserved a place in the Nifty Tech ranks, I also realized that I couldn’t do the review justice on my own. So I turned to the man who literally wrote the book on Twitter: blogger, podcaster, father of podiobooks, and author of “All a Twitter: A Personal and Professional Guide to Social Networking with Twitter,” Tee Morris. Nifty Tech Blog: Tee, thanks for taking the time to talk with me about Twitter. Tee Morris: Not a problem. Taking about Twitter is something I do well. NTB: Let’s start out from the view of someone completely new to Twitter. Why Twitter? With all the different social networks around, what brings people to Twitter? Blogging was always a golden unicorn for me as I would spend hours on posts, and would not get anything done in my writing projects after blogging about writing. Twitter, by design, allows you to get to the point, keep it simple, and then move on. This is one (of many) reasons why it is so popular, but I believe it is its most appealing attribute. NTB: How easy is it for someone to get started with Twitter? TM: Very. You can have Twitter up and running in minutes. Heck, in All a Twitter, I have you up and running in only a few pages. But this is the biggest mistake that people make when starting off with Twitter. What I explain in All a Twitter (and I’m really proud of those readers that follow my advice) is that a first impression is everything. After you set up an account, but before your first tweet, new users need to take care of their profile. When the profile is complete, you then have to think, “Okay. What do I have to say?” Keep it simple. Then, if you think, “I can get into this…” you need to find yourself a good third-party client like Twhirl, DestroyTwitter, or TweetDeck. You start to unlock the potential of Twitter. So yes, you can get started in minutes. To get Twitter running efficiently, you need to invest some time. NTB: Any advice for someone looking to build up his or her network? TM: Yes. Avoid those “Twitter Follower-Gathering” services. This is a very common tactic people use to build up followers, but they don’t know (or if it’s for the Social Media Snake Oil Salesmen or some of the ‘Make Money Online’ authors, they don’t care to know) how these services work. The sites run script that follows random people en masse, then drops them 24-72 hours later, and then picks a whole new group of people, people you may — or may not — share anything in common. And if that inflation of numbers isn’t enough, they tend to slip in ads for their services at random times, usually without the knowledge of the user. My favorite network builders are Mr. Tweet or Tweepi. Both of these services are unobtrusive, do not inflate numbers in a slimy or questionable manner, and allow you to “know” whom it is you’re following. Also look up hashtags of topics you’d want to cover, and look up Trending Topics that Twitter tracks. Not only do Trending Topics make great conversation starters but you can also use them to build your networks. NTB: Can you take a second and explain what hashtags are, and how they’re used? TM: Hashtags (covered in depth in All a Twitter) are a method used to track various subjects on Twitter. I’ve heard people say “Hashtags are dead like Facebook Groups…” (which is sad as I manage a few in Facebook) but I think this is because of goofy hashtags users (like me) tend to come up with to pepper a tweet with that sense of humor. Even with my goofy hashtags, I still use them in earnest. Currently I use hashtags for an event I’m helping out with their Social Media initiative. When people attend CREATE South 2010 this year, the plan is to amend our tweets with #createsouth2010. That is the anatomy of a hashtag: a pound sign with a keyword. It is best to keep hashtags brief, but you need to make sure when people see the hashtag what it’s referencing. If, for example, we were using cs2010, would we be talking about CREATE or the 2010 Adobe CS coming out? Hashtags are great tracking tools, and really tap into the potential of how topics catch on in the Twitterverse. NTB: OK. So you’ve set yourself up on Twitter, and developed a core group of people to interact with. Where can you go from here? What can you do with Twitter? TM: You can use it for conversation. You can use it for promotion of a special event. You can use it to share resources with people that are in the same spheres of influence as you are. Seriously, the question should be “What can’t you do with Twitter?” as your possibilities are endless provided that you participate. People tend to get on to Twitter and then attempt to fly through the Twitterverse on auto-pilot. They use the scripts for the numbers, fill their stream with pre-fabricated tweets, and then walk away without engaging their network. Success with Twitter is not — and I will say this again and again, NOT — the numbers or the amount of tweets you send a day, but it is about your network, how they respond to you, and how you respond to them. As I mentioned in Episode 10 of Bird House Rules, you need to take an active role in your network; and if both you and your Followers have a vested interest in each other, you can achieve anything. NTB: I’d like to raise a counterpoint to this and say that there IS a place for automated tweets in the Twittersphere. For instance, under my Nifty Tech Blog account, I follow a number of Twitter accounts that are basically news aggregators. They automatically tweet headlines and links to articles. Now I will admit that in my personal tweet feed, I would never follow such a feed, but I have a special need to be able to scan headlines as part of my research for this site. So if you’re making the choice to be just an aggregator, you’re catering to a very niche market, and sacrificing your chance to build community. TM: You mistake what I mean by auto-pilot. Automated tweets and auto-pilot are not the same thing. For example, I run two other accounts for organizations: IDGuardian and CreateSouth. I use HootSuite to schedule many tweets so that if I cannot tweet on a regular basis, I have plenty of content heading out to my respective networks. This is not putting an account on auto-pilot though. There are plenty of accounts out there that are spewing out content, and a lot of it is repetitive. The same link and, in one case to many, the same tweet, is repeated ad nauseum. The tweets I’ve scheduled do get responses from people when questions or comments are made. This is what I mean by the engagement of the Community. If someone pings you on Twitter, ping back. Start a conversation, get people taking. News services that you reference are also not spewing out spam or innocuous content. These feeds specialize in headlines on Social Media, on tech news, on the latest headlines from Mashable and Gizmodo, and so on. I don’t think automated tweets are all evil. Just the accounts that really don’t care what their community has to say. NTB: A lot of critics of Twitter complain that they don’t care what someone just had for lunch, and don’t really want to see a bunch of tweets from the bathroom. Anything to say to those critics? TM: In my four years on Twitter, I have never seen someone tweet “I’m going to be the bathroom…” and if they did, I would probably drop them. This is the power of a quality network on Twitter. Strength in numbers. NTB: There are a lot of stories about scams on Twitter, people posting links to pages with viruses, stealing personal information, and hijacking Twitter accounts. What can people do to protect themselves from these scams? TM: Something I’ve said about the Social Media movement on a whole: Social Media is the “Blinking 12:00” of the Internet. So many people want to play with the cool toys, but no one wants to know how they work. The Social Media cheerleaders also do not want people to know that there are some real bottom feeders and opportunistic con artists out there. There is nothing that sets Social Media apart from anything else on the Internet. You have to be careful. For example — Phishing scams via Direct Messages. If a friend pings you with a message that just seems a little weird. In other words, they don’t make the DM personal, that’s your first warning. If you get a DM from someone you rarely hear from, and they’re asking you to click on a link, that’s another reason to be wary. Finally, if you click on the link and a site wants your username and password, the answer is “No.” You just have to be careful, and keep your brain in the “ON” position. NTB: What is the coolest thing about Twitter? TM: It’s people. I have met so many cool people through this service, and this Community never stops surprising me. I consider myself quite lucky to have connected with the people I have through Twitter. NTB: So Twitter at its best emphasizes the social aspect of Social Media? TM: I truly believe it is. There’s a lot of initiatives out there, but have you heard of any Face-to Facebook meetings? What about Podcast Pow-Wow’s? (Well, okay we got Podcamps, so I’m busted there…) but Tweet-up’s tends to happen left and right across the country and around the world. With all its faults and some of its noise, I still believe in Twitter, and I believe it works better than any of the initiatives out there. NTB: Anything else you’d like to say to someone thinking about getting on Twitter? TM: If you want to give Twitter a spin, be patient with it. Don’t think you have to be brilliant with every tweet or as charismatic as Chris Brogan or Coach Deb. All you have to be is yourself, look over your incoming tweets, and chime in with your opinion or viewpoint. That is, after all, what Twitter is all about. NTB: There are a lot of books out now about Twitter. What is different about your approach? TM: All a Twitter is the first, and perhaps the only, title that is written from a user’s perspective. Most of the books that are out there are written by marketing experts, by people who only have one aim: To make a fast buck. They love to talk about communities in between their sales pitches and flavor of the month; but if you review their streams you will notice the comments tend to be one-way, questions asked without follow-ups to replies, and (of course) motivational quotes. I approach Twitter as a guy who wanted to know what his friends were talking about. All a Twitter is my own journal of what I’ve discovered about Twitter, how it works for me and others, and what you can accomplish with it. Throughout the book, you not only get practical exercises on how Twitter and the various applications and services work; but you also get a philosophy on how to work Twitter, and it’s a philosophy that works. NTB: If any of the readers would like to talk to you more about Twitter, how should they contact you? TM: They can find the more professional side of me on ITStudios, but if they want the snark and the sense-of-humor, find me on TeeMonster. 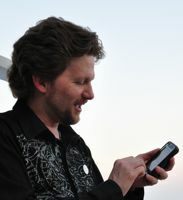 You can also hear me speak at CREATE South 2010 on April 17, and on Memorial Day Weekend I will be a guest at Balticon which has evolved, in my opinion, into the BIGGEST tweet-up on the East Coast. There’s also Bird House Rules, the companion podcast to All a Twitter and Sams Teach Yourself Twitter in 10 Minutes. I ask for feedback there following topics that I’ve covered in the episode. While I do have the show pre-planned, I never shy away from tweets or requests from people who have topics they’d like to hear about but were not addressed in either books or new to Twitter. My door is always open and I love talking shop. NTB: Thanks for talking to us, Tee. TM: Thanks for giving me a chance to talk Twitter. This has been an interview with Tee Morris of TeeMorris.com and ImagineThatStudios.com. Tee is the author of “All a Twitter: A Personal and Professional Guide to Social Networking with Twitter,” and its companion podcast “Bird House Rules”. Nice interview. Good to see you clarifying some of the mysteries of twitter. There are a LOT of misconceptions out there; you and Tee have done a great job addressing many of them.